It is $5 to park on-site at the Arlington Convention Center. The convention center accepts cash and credit cards. Event will close around 2:00 pm following prejudging. This is a live event, so closing time could change based on how long prejudging lasts. Doors will open back up for the evening show at 6:00 pm. Purchase tickets in advance under the TICKET PURCHASE tab below. 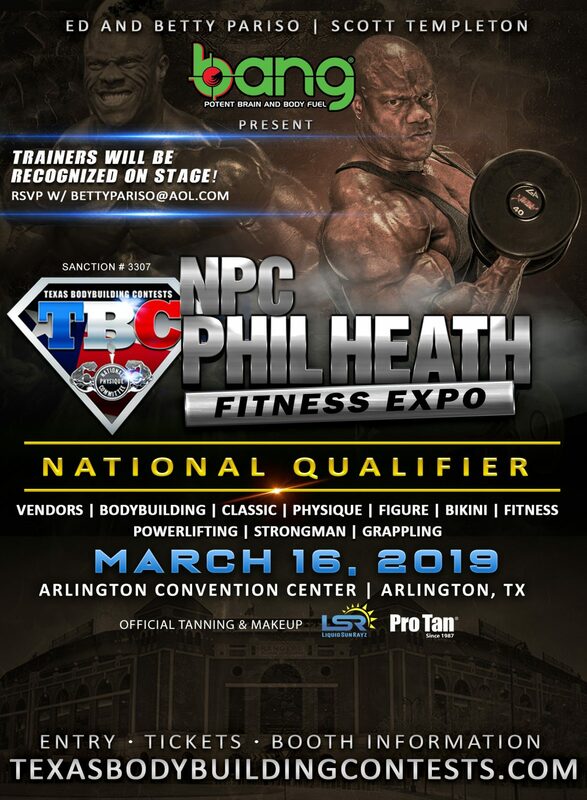 NPC Entry Form & Competitor Information are listed below. Please read over all Competitor Information prior to arriving at the Competitor Check-ins. 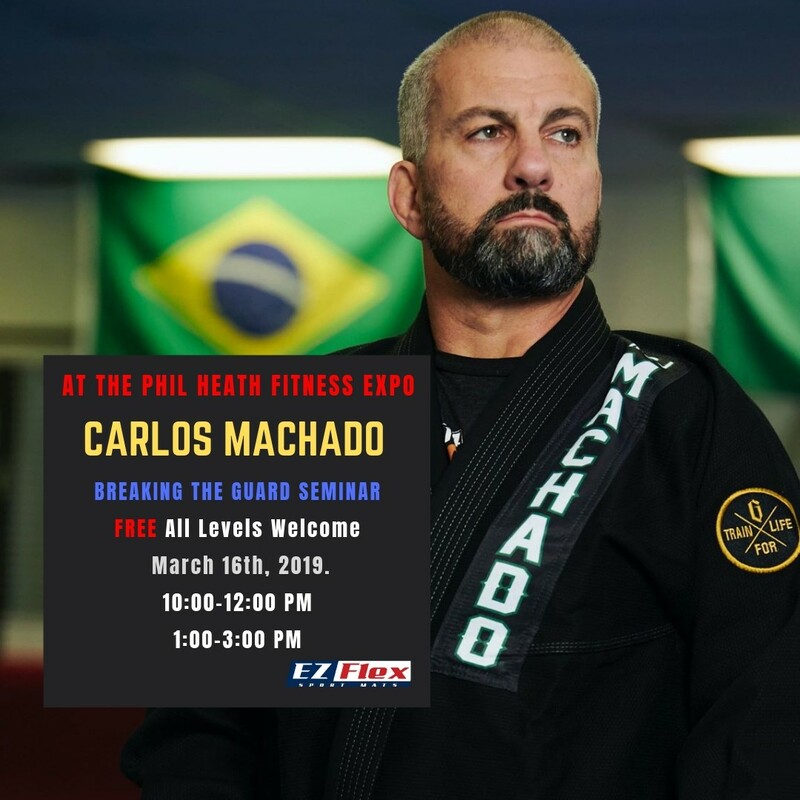 Additional events that will be inside this expo can be found under the EVENTS tab below. Attendees are allowed to use “personal” size cameras to photograph or video individual competitors from the audience. However, photographing each competitor is NOT ALLOWED. We have found that if someone is photographing each competitor, they are most likely using the photos for their personal gain. The photo/video rights to this event have been purchased and are exclusive to these individuals. The audience will be monitored by the event staff. Tripods, monosticks, and large camera bags are NOT ALLOWED in any seating area. Online Competitor Registration is now closed. You can still register at the competitor check-ins on Friday evening. Please download your competitor information below for all of the details. 1. Fill out your Online ENTRY FORM. 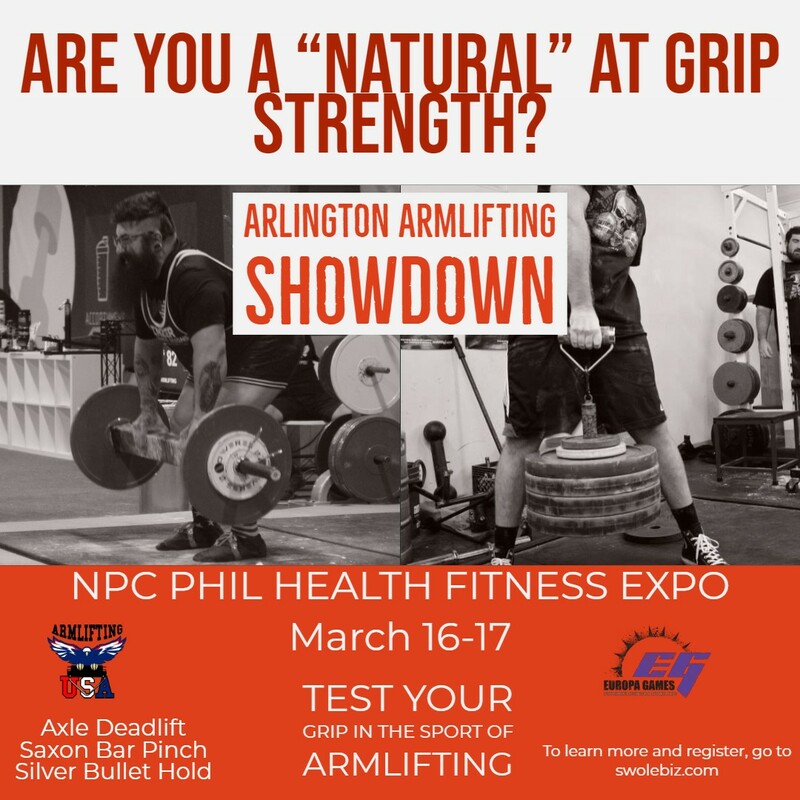 Click on the ‘NPC Entry Form’ tab right here on the show page. 2. Online Entry is $100 per division. Must pay by credit card. – ONLINE ENTRY DEADLINE is Tuesday March 12th, 2019 at 5pm. 3. WE DO accept ENTRIES at the Competitor Meeting. It is a $50 LATE FEE. We accept cash or credit cards for entries at meeting. – b. At the Competitor Meeting for $125 CASH ONLY. 5. Do not wait on your NPC Card to send us your entry. If you have not received your card yet, always keep your NPC card ‘receipt of purchase’ handy and bring to the competitor meeting. 6. Purchase tickets in advance before they sell out. Friends and Family must pay for a ticket to the NPC show. 7. TICKET PURCHASE- Click on the ‘Ticket Purchase’ tab right here on the show page. 8. Book your Tanning – Makeup – Hair. Links for tanning & hair are listed below. ONLY our official tanners are allowed backstage. – Women Competitors must wear their suit bottoms to check in. Wear them underneath your sweats or cover-up. ONLINE ENTRY DEADLINE: Tuesday March 12, 2019 at 5:00pm. You can still register at the competitor meeting. LATE ENTRY FEE: If you register at the competitor meeting, it is still $100 per division, but a $50 late fee will be APPLIED to your entry form. NPC CARD: Can be purchased at the competitor meeting. $125 CASH ONLY. Official tanning companies listed below. You are not required to use this companies, however they are the only companies allowed backstage. Your music CD will be collected on Friday evening at the Competitor Check-in/Meeting. Make sure your music is on a “clean” CD with no other music on this CD. Please write your cell phone # on the CD so that we can quickly contact you if there is a problem with your music. and will allow you to sit in the GENERAL SEATING area during the bodybuilding show. TICKET PURCHASE: Click on ‘Ticket Purchase’ tab right here on the show’s event page. 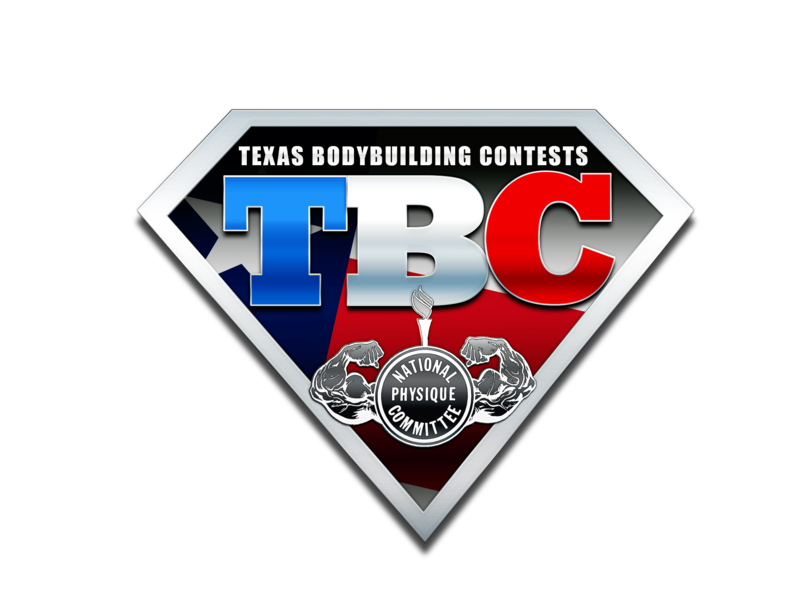 – All Trainers, Friends and Family must purchase a Bodybuilding Seating Ticket. – VIP / RESERVED tickets can be purchased on our website or at the door. – GENERAL SEATING tickets sold at door only. 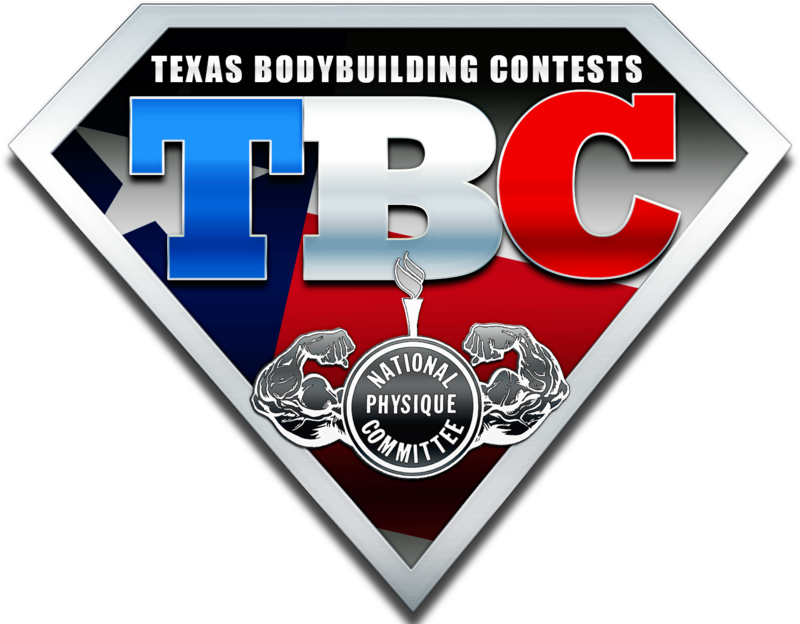 -Includes: Admission in to the seating area for the NPC bodybuilding show & Vendor Area. No Trainers, Friends or Family are allowed back stage, unless they purchase a backstage pass. For liability purposes, they must also be a member of the NPC with an NPC card. – BACKSTAGE PASS: $100 – Can be purchased at the competitor meeting or at the VIP / Reserved Ticketing area the day of the show (limited # available). Must show your NPC card to purchase. – Cash or credit card accepted. Current Exhibitors: Please click on the event link below to download your exhibitor kit, sampling guidelines, set up/tear down times, hotel and convention center information. You can also fill out the pricing request form below, one of our sales representatives will get back with you shortly. Online Ticket Sales have now closed. You can still purchase VIP, Reserved and General Seating at the door the day of the event. Tickets go on sale at 8am! VIP Package Includes: VIP Badge, VIP seating to the Prejudging & Finals. You receive the next best available seat upon ticket purchase. All VIP tickets are standard price regardless of age. VIP Table Includes: VIP Table for Prejudging & Finals (seating up to 8 people) and (8) VIP Badges. You receive the next best available VIP Table upon purchase. Ticket Includes: Reserved seating to prejudging. You receive the next best available seat upon ticket purchase. All Reserved tickets are standard price regardless of age. Ticket Includes: Reserved seating to Finals. You receive the next best available seat upon ticket purchase. All Reserved tickets are standard price regardless of age. Ticket Includes: Open general admission seating to Prejudging. Ticket Includes: Open general admission seating to Finals.